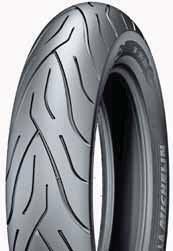 s Independent tests* show that the Michelin ® Commander ® II rear tire lasts almost twice as long as its main competitors. s Unique tread pattern for head-turning looks. s Premium sidewall treatment complements cruiser styling. s Ampliﬁed Density Technology: A highly dense, more-rigid tire casing, which helps deliver excellent feedback and handling. ❚ Aramid tread plies on the rear tire resist centrifugal growth, reduce weight and provide excellent stability. ❚ All-new rubber compounds for remarkable wet grip, without compromising durability. 1Refer to the motorcycle owner’s manual for the vehicle’s load capacity. Michelin recommends the tire pressures quoted by the vehicle manufacturer. 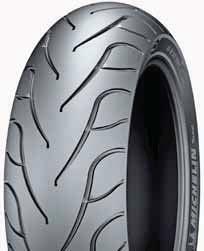 *Weight of MICHELIN® Power PureTM tires in sizes 120/70 ZR 17 and 190/50 ZR 17, compared with Bridgestone BT-016, Dunlop Sportmax Qualiﬁer II, Metzeler Sportec M3 and Pirelli Diablo Rosso. s Square bead wires improve casing rigidity, handling and ease of installation.